• America has 3.1 million millionaires and more than 400 billionaires in its ranks, more than any ther country in the world. • The top three earners (Bill Gates, Warren Buffett and Lawrence Ellison) have a combined net worth of $131 billion, higher than the combined budget shortfall of every single state in the U.S.
• The 24 million least wealthy families in America (with an average U.S. income of $26,487) saw their incomes drop by an average of 10 percent in 2010. 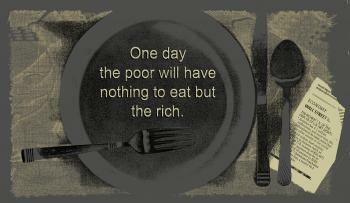 • 1 in every 7 Americans lives below the poverty line, a record 46.2 million people.